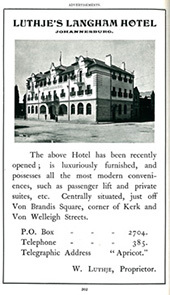 There were major extensions to the hotel in 1935 by KALLENBACH, KENNEDY & FURNER with F MOLLER as the civil engineer who designed the reinforced concrete frame, notable for its large spans, over the public lounge. Rebecca Caplan (nee Goldberg) recorded that her father, Simon Goldberg, bought the hotel in 1929 together with Harry Olshwang for £17,000. It is not known when he sold it.